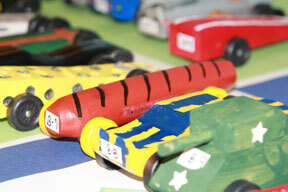 The annual Pinewood Derby was held today at EK School in O’Fallon. Just over 40 boys raced their cars. Several siblings also tested their car building skills at the end of the event. Photos from the event can be see on the Mighty 35 Facebook page here. Congratulations to all the boys who participated. Fun was had by all.